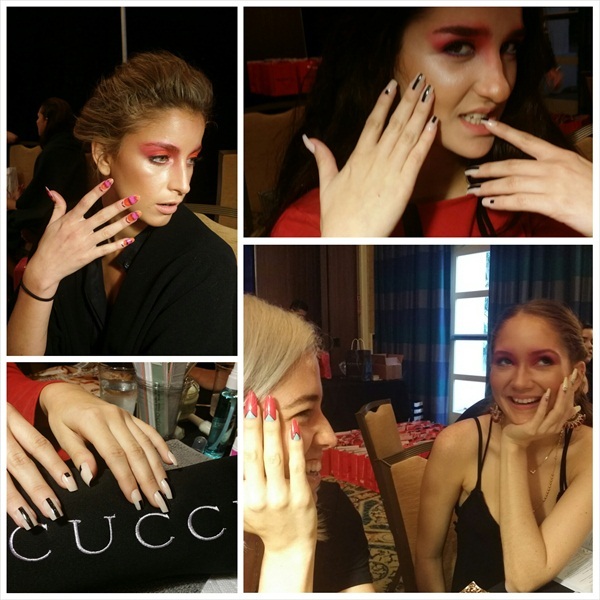 Cuccio Colour made its mark last week during San Juan Moda, as educator Marilyn Garcia and her team created the nails for designer Miriam Budet’s much hyped Summer 2015 “Freedom” Collection. Garcia prepped many sets of the pre-made almond shaped nails in advance to save time. Onsite, each of the 15 models received manicures using Cuccio Nail Solutions, Cuccio Naturale Butter Blends, and the Café Cuccio collection. The six designs featured different sized moons, crescents, and bold stripes and were often followed up with eye-popping cuticle tattoos.